IV Cannulae with small projection on needle hub and special needle cover design. Plain IV Cannula without Injection Valve and without wings. Full-proof mechanism to ensure correct orientation of needle bevel. Long and broad needle hub for better grip and control during cannulation. 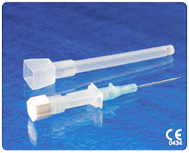 Specially designed long needle cover which can be used for safe disposal of needle after catheter placement to prevent needle stick injuries. Very useful in high-risk cases where no extra opening is permitted for risk of infection. Colour coded body for gauge size identification. Ref/Art No. Gauge Colour Code Ext. Dia.